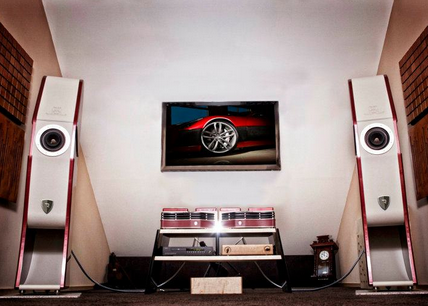 Vilner Studios has developed a hi-end audio system, priced at a stupendous US $62,780. Previously renowned in the automobile-industry interiors sector, Vilmer Studios has now diversified into sound and audio products. The $62,780 audio system developed by them is inspired by the Rimac Concept One supercar, a multimillion dollar Croatian electric car, which they also had a hand in designing. ‘A’ class push-and-pull, three-stage mono amplifiers, with pure silver wiring. These amplifiers also operate Russian manufactured GU50 pentodes without feedback. Special Birch plywood cabinets crafted in Ukraine. An Aero Horn speaker, which also has a 339 cm folded horn behind a 98dB wide-bander. It possesses a ‘powerful Cobalt magnet system’, and was produced by Etheraudio, a leading Bulgaria-based firm. The Hookup wiring is also made from solid-core silver, in Teflon dielectric. Vilner Studios also provides customised audio systems for individual customers. Depending on the room interior in which the Vilner audio system will be placed, customers can choose from different materials for the audio system exterior. These materials include exotic wood veneers, leather, composite stones, carbon-fibre, polished covers, polished aluminium-trim or polished brass-trim.